Guests will stay in one of two large lodges in the village, each with several bedrooms and one or two bathrooms. Sararo Lodge is pictured to the left. There are additional bathrooms in the bathhouse between the two lodges. The bathrooms feature flush toilets, sinks and showers. The water is not heated, but it’s hot enough here that a cold shower at the end of the day feels great! The beds are mostly single beds (just one double at the moment), with linens and mosquito nets. The lodges have screened windows and curtains were just installed for more privacy. In addition to the two lodges and the bathhouse, there is a newly-constructed kitchen and dining room that is screened in and absolutely beautiful, as well as a large traditional leaf house with a fireplace set in the middle. The meals will be served buffet style, oriented toward the American palate. Local ingredients will be integrated into the dishes as available, but efforts are made to ensure that visitors do not use up the limited food resources available to the residents of Zábalo. Most ingredients will be transported from markets upriver in advance of the group’s arrival and our Cofán hosts will prepare dishes that are delicious and pleasing to visitors like us. 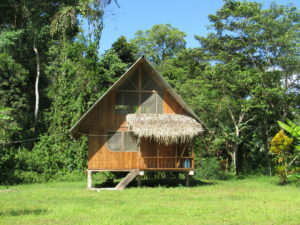 The Sararo Lodge complex is located about 200 meters from the Aguarico River and about 100 meters from the edge of Zábalo Village, so access is fairly easy. Guests will be provided with rubber boots for exploring the village and forest, very handy when it rains and excellent protection against insects or other creatures. The village is populated by approximately 120 people, with a wide range of ages, including many children. All villagers speak Cofán, and many know or are learning Spanish. A few know English, some quite well. We will provide translators as needed to facilitate communication. The people of Zábalo are very excited about the groups we have been bringing, faith-based groups who are interested in more than the wildlife. They tend to be quiet and reserved among strangers, especially at first, but appreciate the chance to interact with people who show interest in them and are proud of their forest and the life it sustains. Showing us this amazing place provides decent and dignified work that sustains people economically as well as helping to validate their culture and lifestyle. They really are the “Guardians of the Forest”. –Jerrell Ross Richer, Tour Leader and Goshen College Professor of Economics. CLICK HERE for further details on the Natural and Cultural Encounters in the Amazon tour.